If the cryptic title of today’s post seems bizarre please remember that for most people microscopy is limited to only one sort: light microscopy. Further one could say that for most people light microscopy is limited to one particular sort: bright field. For the last few posts we’ve been getting into polarized light microscopy in a very general way and with that in mind the obscure little title should make perfect sense. XN is still used in some papers by authors who wish to refer immediately to crossed Nicol prisms, or crossed polaraizer and analyzer. In practice one may rapidly find the point at which their polarizer and analyzer are crossed by turning one or the other until the light which is seen to pass between the two is at its lowest ebb. 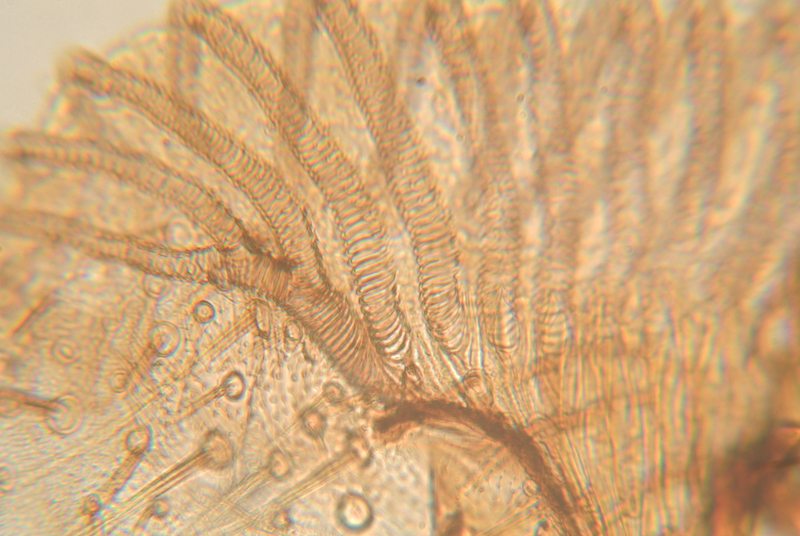 The following photomicrographs were all taken with trinocular AO Spencer microscope using a Nikon 1 J1 consumer grade digital camera fitted with a Nikon 1 to c-mount adapter and c-mount to 23.3mm microscope eyepiece tube adapter. 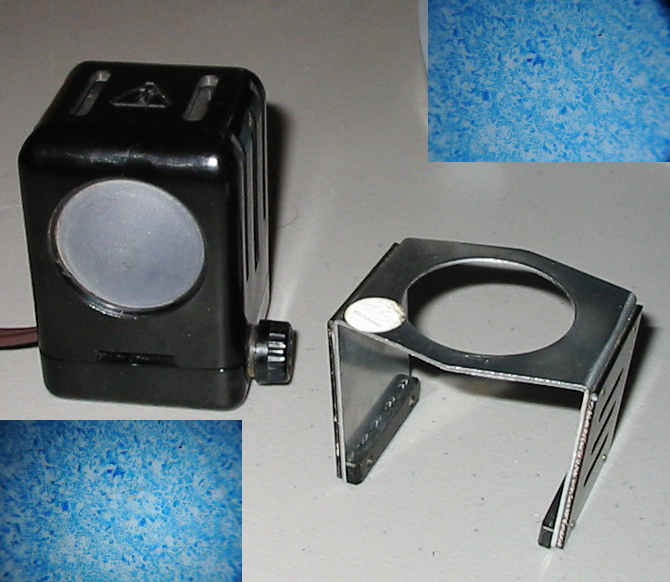 The polarizing apparatus was constructed out of two small discs of polarizing film which cost only $5.00 with shipping. If a full sized image is desired one need only click the image but be warned they are several MB in size. First will be shown the specimen in bright field, followed by the object under XN. 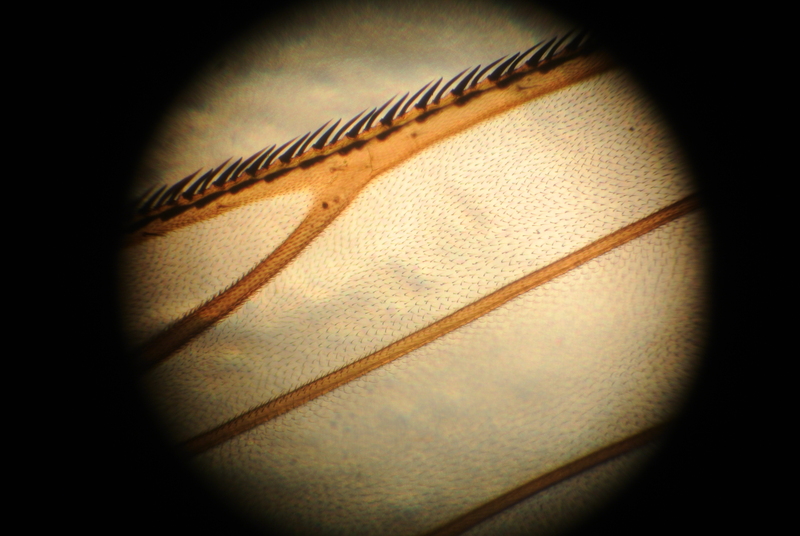 Portion of a fly wing. 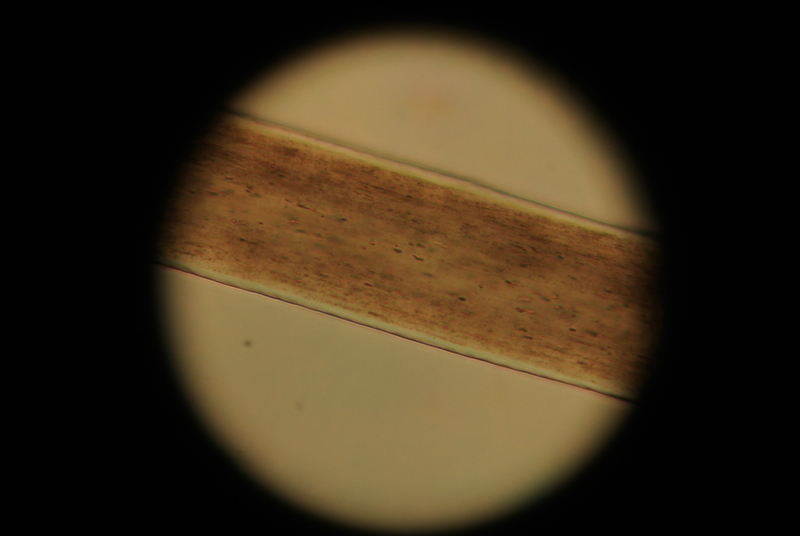 Many natural fibers, everything from cotton to the hair on ones head, are strongly birefringent. Different forms of fiber will show differently under crossed pols. 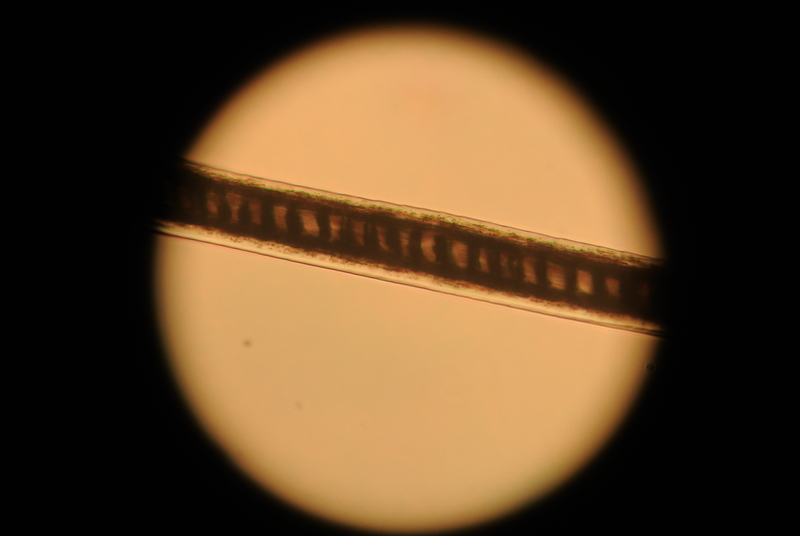 A motivated individual can discern much from a hair without resorting to such destructive methods as scale casting. 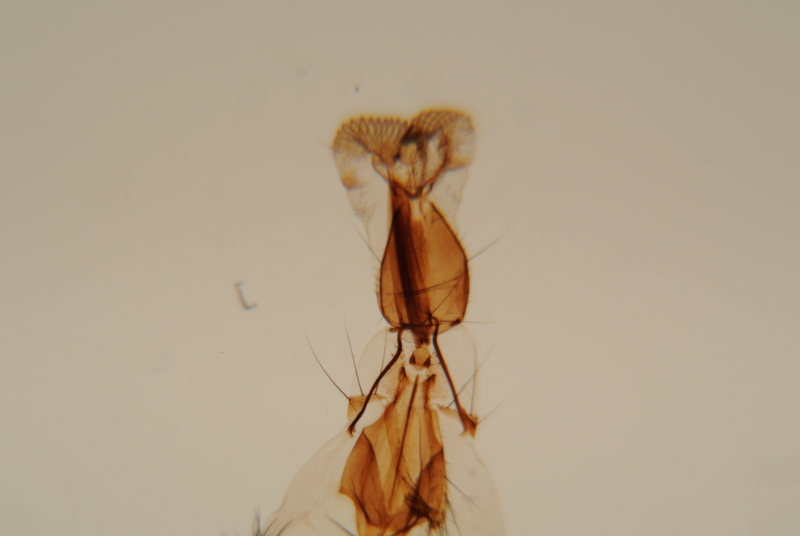 Insects may be surprisingly dull subjects for polarized light and the process may do little but reveal how much dust was remaining on the specimen, as in the case of a hastily mounted flies wing which was collected from a disused attic. At times one may find with surprise that small portions are powerfully birefringent, as in the case of the hardened, venomous, forcipule of the garden centipede pictured above. 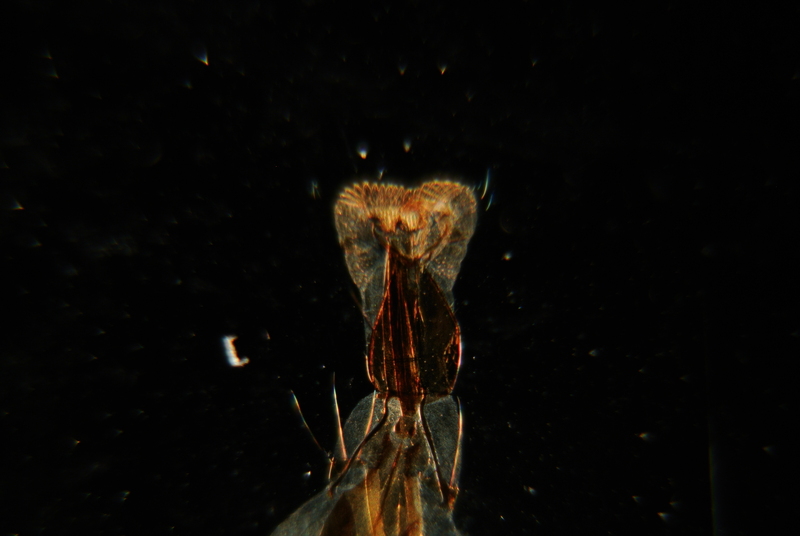 Frequently only the mouth parts of a specimen will show double refraction. This simple fact can be immensely helpful when trying to identify the mouth parts accurately in whole mounts, especially when optical sectioning is insufficient. For digital photomicrography a consumer grade mirror-less digital camera with removable lens is mounted over the eyepiece with a two part connector. 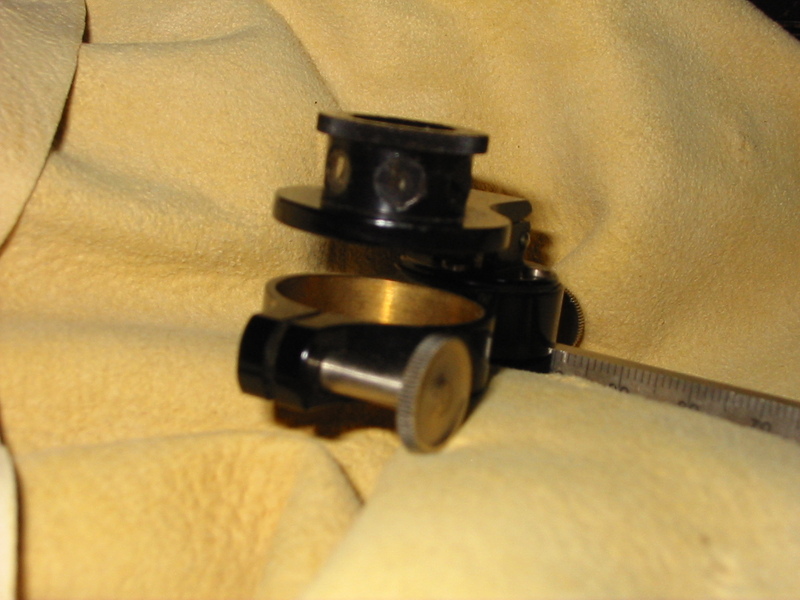 The first part fits into the cameras lens socket and is friction fit to the second part which fits over the microscopes tube and rests upon its shoulder. The camera may be removed at any time without difficulty and all apparatus is away from the ocular so that it is un-obstructed and may be changed. With the camera removed the microscope may be focused as normal without recourse to the cameras display. As the imaging sensor is at the microscopes eyepoint no secondary focusing is required when the camera is moved into place. 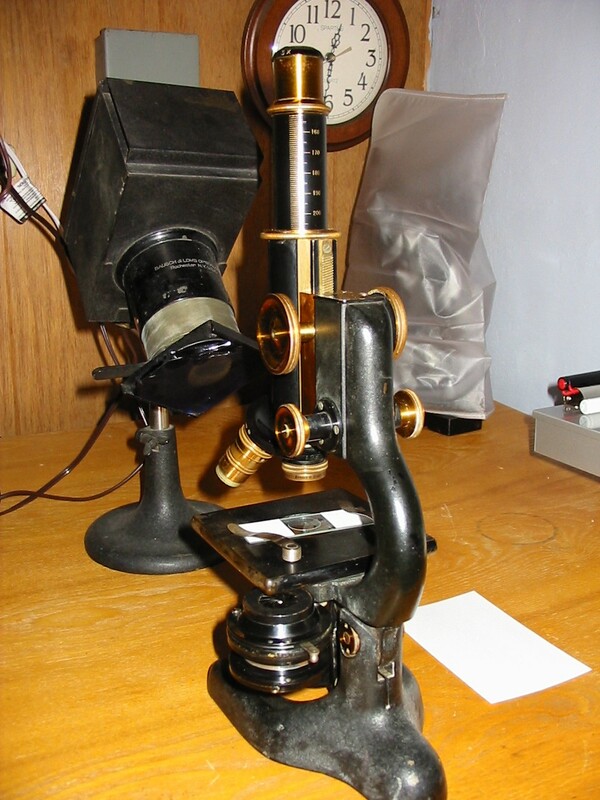 The microscope is that same common workhorse that has been featured in the previous entries. Lighting is provided by a single 60 watt cool-white incandescent bulb in a goose-neck desk lamp. A 5x Huygenian ocular is used for every image. The camera is an older Nikon 1 J1. Anyone desiring to know the settings used for each exposure is advised to check EXIF data for each image. 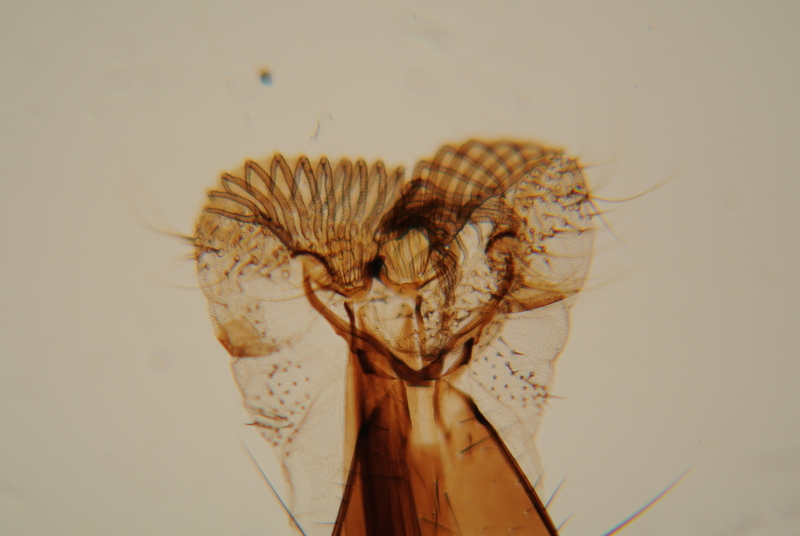 A traditional test object, the proboscis of a blow fly, is used for each image. Be warned, clicking on the images will display a full size (3872×2592) image of several megabytes size. First we remove the lower portion of the divisible 10x objective leaving a perfectly serviceable 32mm equivalent focus objective. A larger aperture opening is spun into place with the circular diaphragm to avoid vignetting the image. Not bad considering the aberration inherent in such a lens. Observe that despite being relatively close to the center of the field of view the finer points of tung are out of focus. With the assembled 10x divisible objective (16mm EF 0.25NA) spherical aberration in particular is much less obvious. A smaller opening of the circular diaphragm is selected to provide better contrast and reduce glare. No realignment of the concave mirror was made. Much more of the structure of the tung may be made out although the depth of field is noticeably lacking. 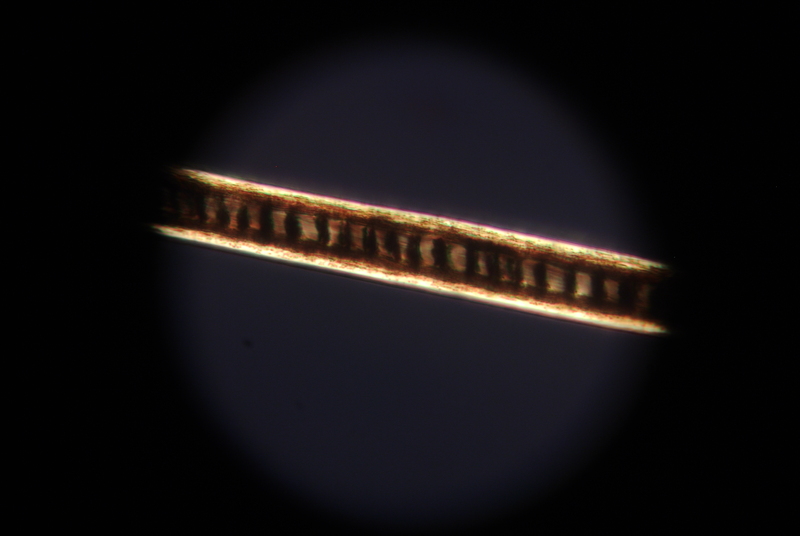 Only the smallest evidence of chromatic aberration is visible. Despite what is a very rudimentary lighting system the field is bright and even. Switching to the 43x (4mm EF 0.65NA) objective we switch also to the smallest available aperture in our circular diaphragm. 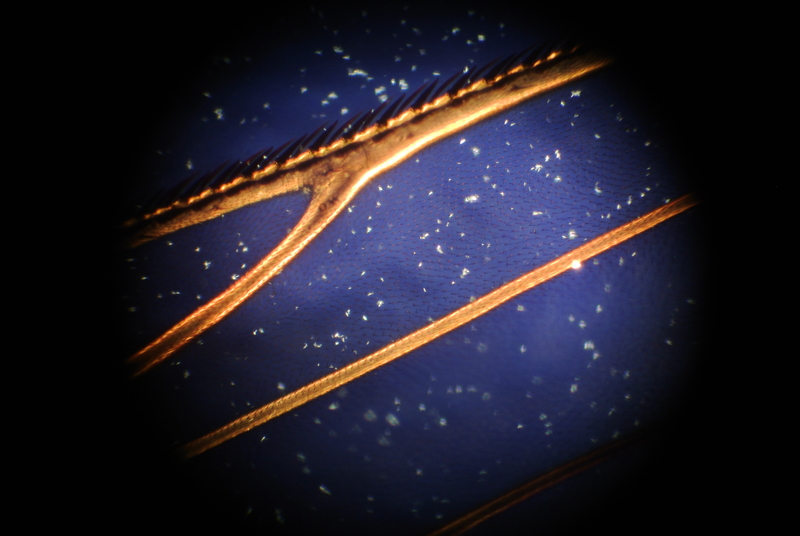 Unlike the previous change in magnification using the divisible objective the change from 10x to 43x is relatively parfocal and a few turn of the fine focus results in the following image. The field is surprisingly well lit for the absence of a condenser. One may observe that depth of field is more than one might expect especially when considering the relative thickness of the specimen. The color fringes of chromatic aberration are in evidence and anyone accustomed or intending to do much work at this magnification would surely be unsatisfied with the image. Understandably, one with experience might forget that those relatively new to the pursuit are less sensitive to such things and would likely be rather happy with the quality of the above image. Turning the arm of the mirror sharply to one side and switching to the largest opening of the circular diaphragm we are able to take advantage of an all but forgotten lighting technique. A shade is placed so that the area below the diaphragm opening rests in shadow and the lower portion of the divisible 10x objective is removed. Oblique lighting is not generally possible with a substage condenser. Specialized stops may be put into place but even then the obliqueness of the light is subject certain limitations relating to the working distance and numerical aperture of the condenser. Here a starkly black background is visible because the surface of the table is black and out of focus for the objective. The specimen is brightly lit by the mirror and that light which it sends into the objective. Every speck of dust on the slide is noticeable and in the full size image one has no trouble at all in identifying to which side the mirror was swung (to the left). 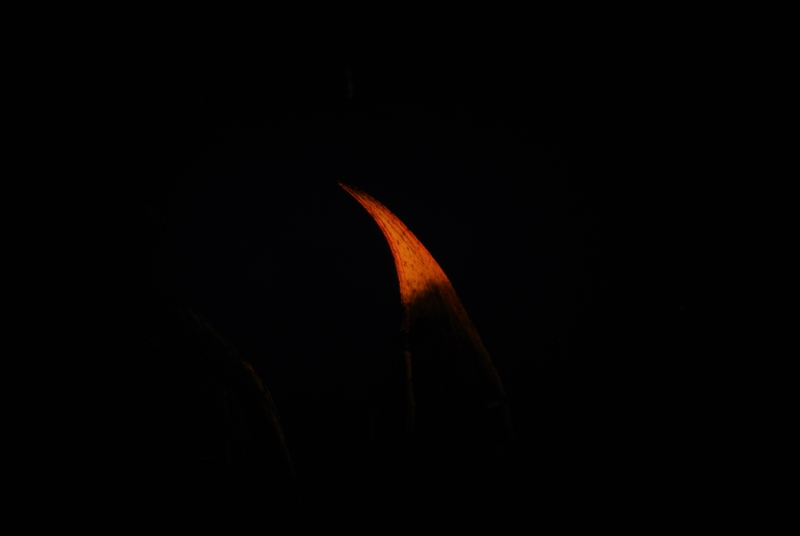 With the fully assembled 10x objective a passable image is produced which is serviceable as a “poor mans dark-field”. Patch stops intended to render a standard condenser a dark-field substitute do not provide so dark a background. 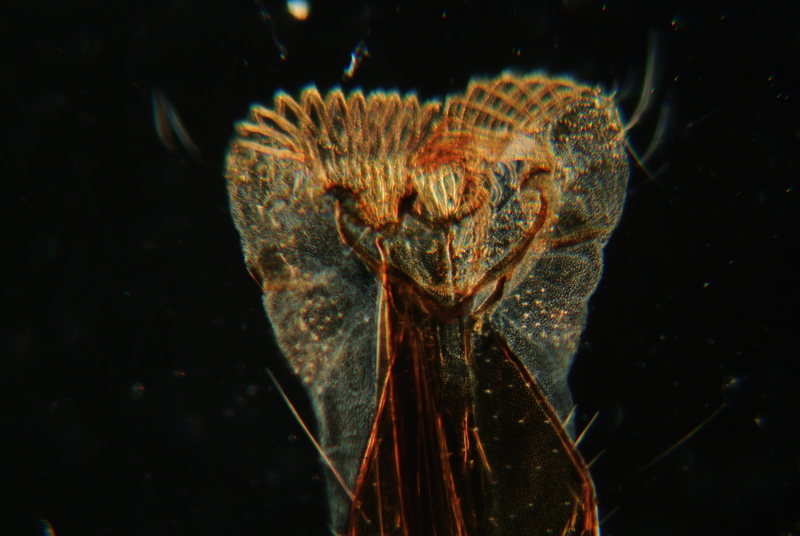 Projection microscopy can be a means to many ends. One might use it for group demonstrations, measurement, specimen comparison, even casual viewing if one is so inclined. Of course it’s looked at here for the purposes of micrography, to which it is particularly well suited. Micrography which is aided by projection of the image onto the drawing surface is considerably easier than many of the other methods to acquire. It is also among the more inexpensive methods though very much reliant upon the conditions of ones work area. In the previous methods looked at one required only the usual set up and a skill at drawing with perhaps a graticule for assistance. 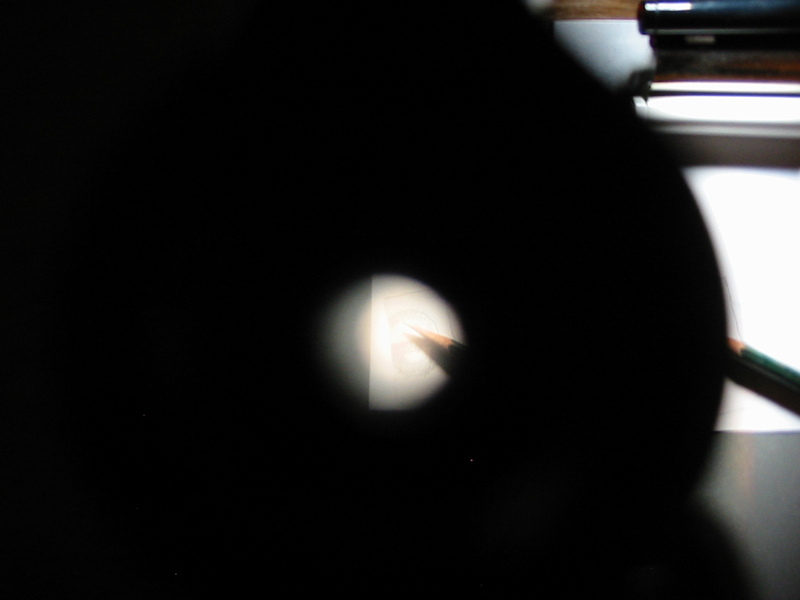 In projection micrography one may be excused for initially thinking that a projection microscope is required, but that is just not the case; one can get by with little more than a microscope. Naturally there are bits of equipment than can simplify things, specialized accesories and specialized microscopes one can purchase, but if one is without funds to do so, or just eager to try projection micrography today with what is on hand there is no need to wait. One will need a microscope which may be inclined so that the eyepiece is horizontal, a powerful illuminator, and paper and pencil. When gazing into the ocular one is presented with a magnified virtual image that is optimally viewed at the eyepoint of the ocular. However, when the eye is beyond the eyepoint of the ocular, or the ocular is removed, the virtual image can still be observed. An other image is produced however, a real image. This image can be thrown upon a screen or sheet of paper simply by placing it in the path of the rays which pass through the objective or objective and ocular. 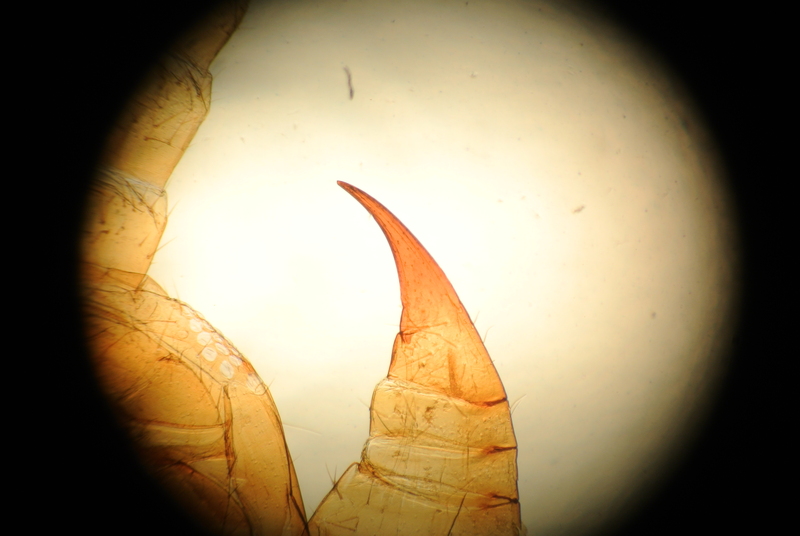 The size (not the magnification) of the image on the screen moderated by nothing more than the distance of the microscope from the screen. With a traditional microscope one may incline the stand horizontally and using an external illuminator send light directly through the slide without making use of the mirror. 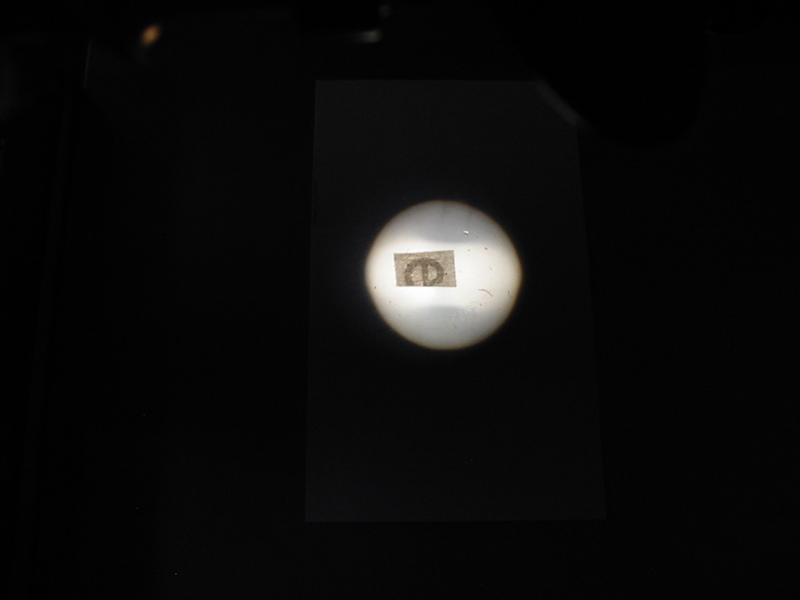 If a wall (with a paper affixed to it) is sufficiently nearby, the room is sufficiently dark, and the illuminator sufficiently bright, one may simply focus the specimen by observing the image thrown upon the wall and trace it onto the paper. In some cases it will be helpful to use only objectives and oculars of the lowest power, or to employ only optics which have large object lenses that permit more light to pass though. Drawing on a vertical surface is rather awkward and one would naturally prefer to have the image thrown onto a table. This is where various specialized bits come into play. 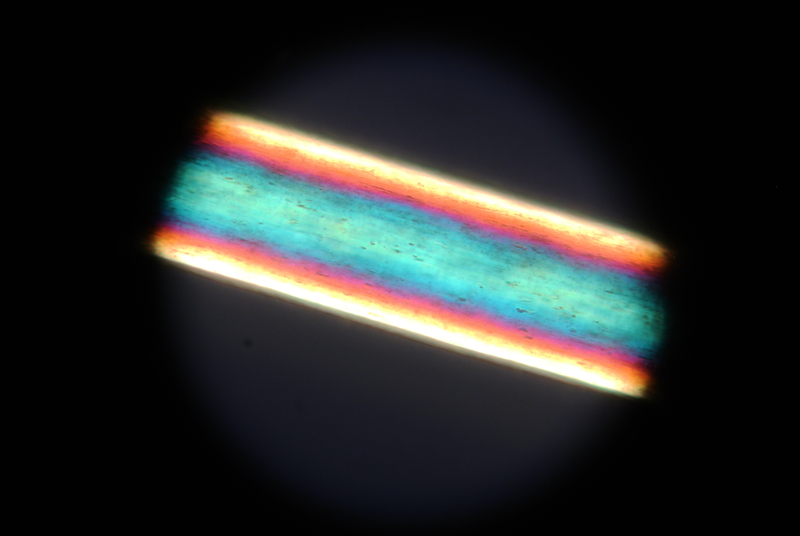 Prisms and mirrors can be positioned so as to send the image from the microscope onto a table or wall regardless of the position of the body tube. The simplest sort of device is a mirror that may be positioned at forty-five degrees from the horizontal body tube, and constructed quite cheaply from a ladies compact. To size the image conveniently it may be necessary to place a book beneath the foot of the microscope. Below is an example of the set up which makes use of a mirror made for the purpose by the Bausch & Lomb company. The objective is a 32mm (160mm Tube Length) achromat. Lange’s is an indispensable resource in any lab! One might have seen projection oculars available and be tempted to believe that any poor results experienced are the fault of the optics. Before spending the money on specialty oculars (which have their uses) one might observe the images below. The first image is that from a regular 12.5x Huygenian by B&L, while the second is a 12.5x projection ocular by B&L. All else being the same, (except for the steadiness of my hand at the camera) one notices immediately that the first ocular produces a sharper, more tightly constrained image. Why then are projection oculars generally more expensive? Without getting into it, lets just say that they have their uses and under particular conditions to which they are suited they more than justify their expense. The demonstration here is to illustrate that one needn’t have a special set of optics to project an image for micrography. The image below was made without any ocular at all. One can see that the letter “e” is oriented differently than in the images made with an ocular. If one cares to recall that there are no extra optics in the body of this particular microscope,only the objective and mirror being used to create the image, one can better understand something of optical principles. One should also note the uneven illumination of the field because this was example was not set up for either critical or Köhler illumination. 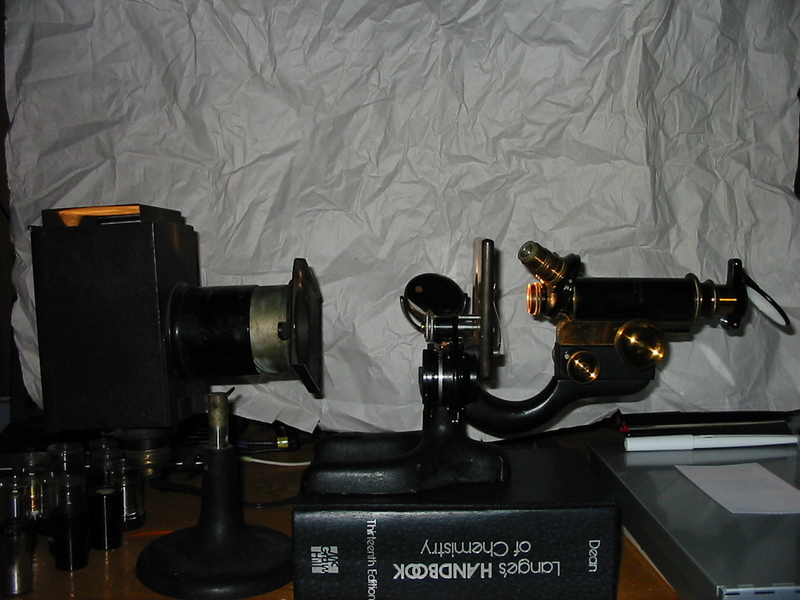 Historically oculars were not used for much projection or photographic uses, the reason was largely related to the apparatus employed but it is worth mentioning that in most circumstances if an ocular is not used one can obtain a brighter image; by using a 40x objective alone rather than with a 4x objective and 10x ocular together for example. 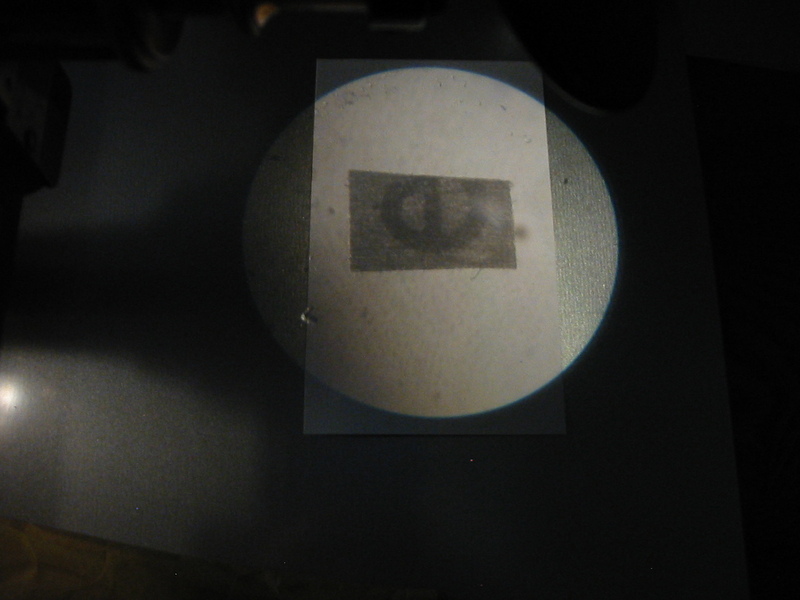 Why not try projection micrography today! It can be a wonderful way to better understand the optical workings of ones microscope and produce micrographs at the same time. 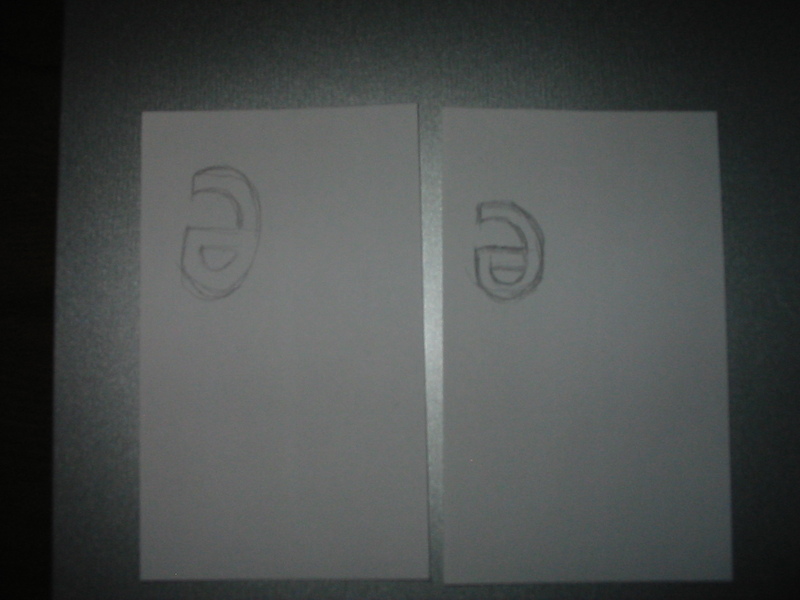 Below is a sketch of the letter “e” slide produced by this technique. As with the previous micrographs the sketch was made in under five minutes. Because of the method used more detail could be put into the image, which is also more precise than any of the micrographs produced previously. If one wishes to ensure that the image is accurately projected be certain to use a reflector that is large enough, and near enough to the eyepiece (if one is used), to project the entire field of view. It is then a simple mater to measure perpendicular axes of the projected image to ensure it is circular. As a final word on this method: the darker the work room the easier things will be. Whatever method of micrography one settles upon the skills used for freehand will be put to use, by all means take some time with the following even if the intent is to expend funds and effort on more complex apparatus late; don’t put aside freehand as to difficult or simplistic. To better serve as a font of practicality, certain points must be established at the outset. If following along one would do well to use the same microscope, ocular (or series of oculars), and objective (or series of objectives) for every method and apparatus. It’s not so important that they be of the same power as those here employed but it will be a great asset not to later have some question as to what optics precisely were used. One should use the same slide as well, and for that slide no better may be selected than a permanent or temporary mount of a small letter “e” upon newsprint. It will prove useful as a means of coming to a better understanding of ones microscope, is accessible to all, and comparatively easy object for sketching (although not without the opportunity for additional details). Select the smallest print to be found and mount the letter erect upon the slide. Drawing freehand from sight is an ability that is quite beyond simple instructions here though all that is needed for it is practice. Instead every effort will be made to set one down the right path to creating micrographs at the outset and skill permitted to develop naturally. However straightforward it may seem, one should not to simply look through the ocular and sketch out an image. Some fine artists may enjoy great sucess in this immediately, but mere mortals would do better to seek out every advantage. First one should consider lighting, not of the specimen but of the work area. Every effort should be made to light the room to an intensity appropriate with that seen through the ocular. For many the optical bench is often well lit which will be found excessively tiresome on the eyes when the long periods of observation required by micrography (particularly at the outset) are spent. It is helpful to use somewhat less illumination on the drawing surface than is had through the ocular. Ninety years ago one would have made use of sunlight, an oil lantern, or even a 6volt incandescent bulb for micrography. The other options (carbon arcs for example) proving too brilliant or costly even, for high powered work that did not involve a camera. With such sources of light it was often simply a matter of drawing the shades or extinguishing the rooms other light sources; the illuminator providing light for the specimen with enough spilling out to comfortably light the drawing surface. 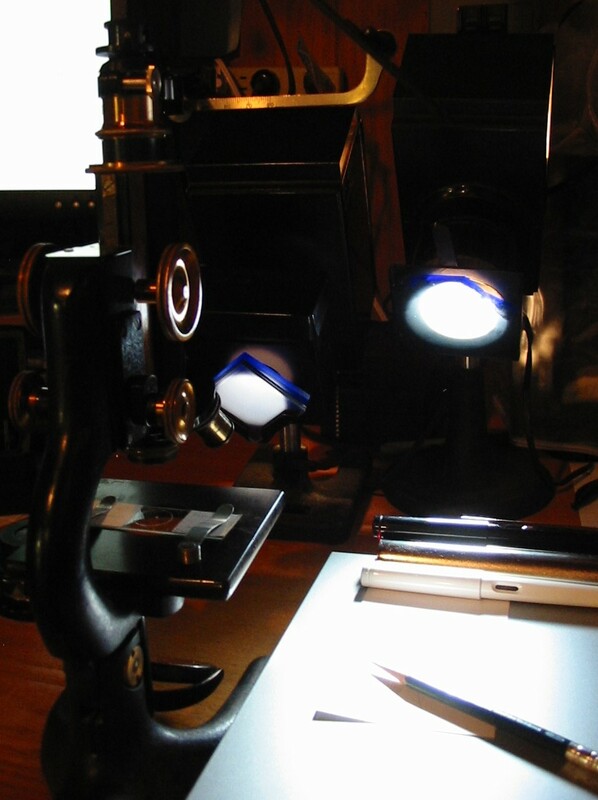 Today those sources may still be used (often in conjunction with various improvised shades), but as ones microscope is apt to include a built in illuminator which is quite effective in limiting light leakage it becomes somewhat more of a challenge to light the drawing surface well. A desk lamp which may be equipped with a dimmer is quite useful if one is without a light source such as depicted. The drawing surface should be comfortably lit so that with one eye looking through the ocular the other may gaze upon it without straining. An older B&L with a lovely 32mm objective of 215mm tube length. Which brings out the next point worth making, both eyes should be used. One eye should be always at the ocular while the other, remaining open, should gaze upon the drawing surface. This is essentially the same method one should utilize in operating a monocular microscope, except that instead of being allowed to completely relax the other eye is focused upon the drawing surface. It is something of a tiering arrangement which is why having a well lit drawing surface that is not too bright or dim is so important. If one is accustomed to wearing eyeglasses for myopia they will be need to be worn only if the drawing surface can not be seen otherwise. This is likely to prove inconvenient for those who do not possess oculars of a high eyepoint, though moving the spectacles as close to the eye as possible will often help enough that standard oculars may be used. For paper one should use a heavy stock of very slight texture. Coarse surfaced paper will prevent one from capturing finer detail when working with sharply defined specimens and light weight papers will not bear sketching well. The plain side of a standard index card is very convenient and easily sorted and stored as well, notes being made on the reverse. Work always with a pencil initially and try not to fear making a mistake. Once the sketch is made it’s a simple matter to go in with ink if it is felt necessary. Initially one will do well to maintain the drawing surface at the same angle as the stage of the microscope, if not the same level as well. 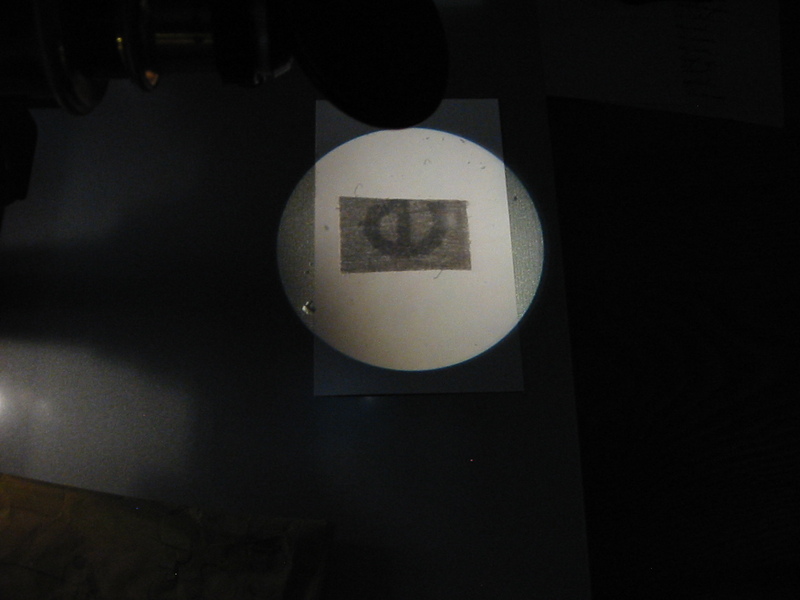 Try this experiment, focus the letter “e” slide with a low power objective and eyepiece and produce two freehand sketches. In the first sketch incline the stage of the microscope as one finds comfortable and use as the drawing surface the table on which the microscope stands. For the second sketch keep the stage of the microscope level and use something suitable to raise the drawing surface to the level of the microscope stage. Produce the sketches rapidly but not without undue care, it should not require more than a minute and only general outlines are needed. See, no need to go for perfection! One will find that although their is no special optical apparatus in use (save the microscope of course) the brain processes the image differently when the drawing surface is not at the same inclination as the microscope stage and the sketch in the first instance is rather elongated on the axis of inclination. Additionally, note that although the degree of magnification employed was consistent in each sketch (a 5x ocular and 32mm objective) the first ended up somewhat larger than the second. By making use of each eye simultaneously the manner in which the brain processes the image is such that the first sketch is produced larger to account for the added distance. If one wishes to get into the matter a series of experiments may be made with optics of similar magnification and different equivalent focus (remember most microscope optics produce a magnified virtual image that is seen as though 25cm from the eye) which will prove diverting… but back to micrography. On the back (generally ruled side) of the cards mark notes regarding the image and the setup by which it was produced. At a minimum include the objective and ocular used and relative position of the microscope and drawing surface. The date and information about the slide would be well included but are not essential, the thing here is to get into the habit of producing micrographs in something of a consistent manner. One should produce a quantity of quick sketches making use of differing arrangements of microscope and drawing surface until a useful preference is discovered. Some will find that they prefer to have only the table while others may favor some elevated and angled drawing surface. The idea is to get into the habit of using each eye simultaneously and abolish that fear some people have in setting lead to paper. These micrographs are not liable to stand publication but there is no reason to feel anything other than pride in them however they come out, it’s a dying art and any effort in keeping it alive should be commended. Aside from that consider my quick sketches from above, and the slide from which they were made. On the slide the letter “e” was mounted erect and seen on the stage before me appeared as it would when reading. 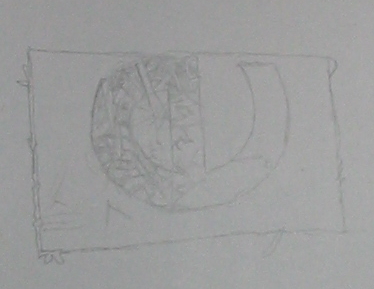 In the sketch the letter was reversed along both the horizontal and vertical axis. Now in my case I was using a rather simple compound microscope having only the obvious optical components. There are no prisms or lenses hidden away in the body tube and no inclined head to consider. If I were to use an AO Spencer One-Sixty or a B&L Balplan with their accompanying internal optics how might I expect my sketch to differ and what would that mean is going on inside the body of the microscope? It’s all well and good to note the way in which the image moves when the slide is manipulated but a clearer understanding is certain to be had by considering the optics at play in microscopes of differing construction. Monocular microscopes are of course well suited to this application but there is no reason one should not be able to employ a binocular head if that is all which is available. Simply use only one (that which is on the side of ones dominant hand) of the two ocular tubes and proceed as if a monocular set up were employed. A right handed individual would place their left eye at the right most ocular and view the drawing surface with the right eye. Next time: Graticules and Huygenian Oculars!